Never go without a gorgeous Matte Lipstick! A smooth swipe of this NYX Professional Makeup Matte Lipstick delivers highly pigmented, richly formulated and long-wearing colour. The formula glides on smoothly and stays put with a non-drying matte finish.Now available in a range of fresh new hues, these playful pops of color are just what your spring wardrobe needs! Now available in a range of fresh new hues. Additional Information : Presenting striking matte finish, highly pigmented and long-lasting NYX Professional Makeup Matte Lipsticks which glide on smooth and perfectly and are available in wide range of vibrant shades and colours. Swipe on your favourite creamy colour and lasting soft matte NYX Professional Makeup Lipsticks ranging in full, medium or sheer coverage and pick your personal favourite from varied super matte, glossy or creamy finish NYX Professional Makeup Lipsticks in bold and neutral colours suitable for all skin types. Explore the entire range of Lipstick available on Nykaa. 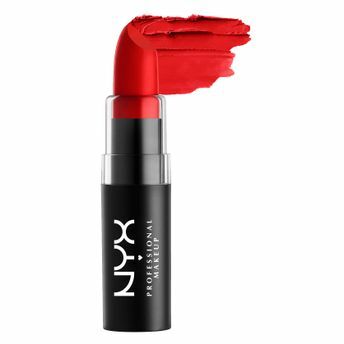 Shop more NYX Professional Makeup products here.You can browse through the complete world of NYX Professional Makeup Lipstick .Alternatively, you can also find many more products from the NYX Professional Makeup Matte Lipstick range.